Regimental dress swords are sought after today by members of the armed forces for their passing out parades and this has kept the demand for Officer's dress swords competitive. Victorian and Edwardian examples start at £100-£150, rising up towards the £300-£400 price bracket for a good example by makers such as Wilkinson. A George VI Royal Scots Officer's dress sword made by Wilkinson of London, which sold for £780 in a Collectors' auction. The variety of sword types and patterns is extensive from hunting hangers to cavalry swords and sword bayonets. 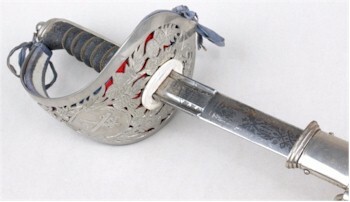 The example of an Eastern European sabre shown below, illustrates the range of decoration employed, which no doubt reflects its £3,300 hammer price. An eastern European sabre of Karabela type, with a 71cm curved and fullered blade, which sold at auction for £3,300 in the Edged Weaponry section of a Collectors Sale. 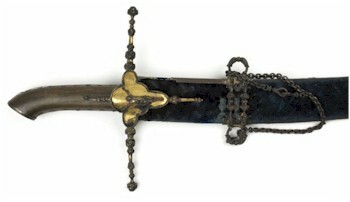 18th century Royal Naval commemorative swords are exquisite in their detailed decoration and bluing of the steel. Made for presentation to officers involved in actions such as Trafalgar and the Nile, these command £20,000-£30,000 estimates at auction. A Japanese Katana with 77cm blade, with cast iron tsuba, fishskin and cord bound tsaya having gilt metal menuki, contained in a lacquered saya. Japanese swords have continued to entice collectors for the quality of the blades and the sword fittings. A Second World War Japanese officer's katana with single mekugi-ana and bronze tsuba is obtainable from £400-£600 for those looking to start a collection. One only has to see the range of research and study devoted to Japanese swords to understand that, with such enthusiasm for the subject, it is no wonder that collectors are willing to pay from £5,000-£20,000 for a 17th or 18th century example of a katana. 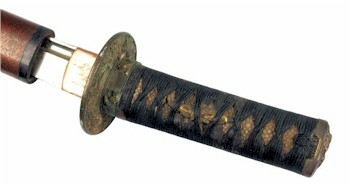 A Japanese wakizashi the 41.5cm fullered blade with two meguki-ana, the gilt bronze tsuba decorated with flowerheads, complete with fishskin and cord.